Have you ever spent any time in an arcade? Specifically one where there were giant glamorous arcade machines that played things like Street Fighter or Mortal Kombat? 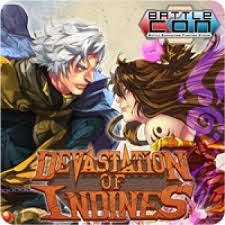 If that pictures is at all bringing back fond memories, do yourself a favor and buy Devastation of Indines. It will be 100% worth your while. The basic mechanic within the game is thus: Two fighters enter, one leaves. The players start by choosing the character they want to play. There are 30 characters to choose from, not counting the extras you can get from a previous BattleCON game War of Indines. The Characters range from a woman who has a Demon Claw, to a sniper, to a man who can create and destroy entire planes of existence. My favorite is the dog who can control time. Some characters are more complicated than others, but the game does a good job of separating Beginner characters from Master level ones, without making the game feel unbalanced. Like any fighting game, there are good matchups and bad matchups, but I've never felt so behind that there couldn't be a comeback. Once everyone has a character, the game goes in a number of rounds, called Beats. 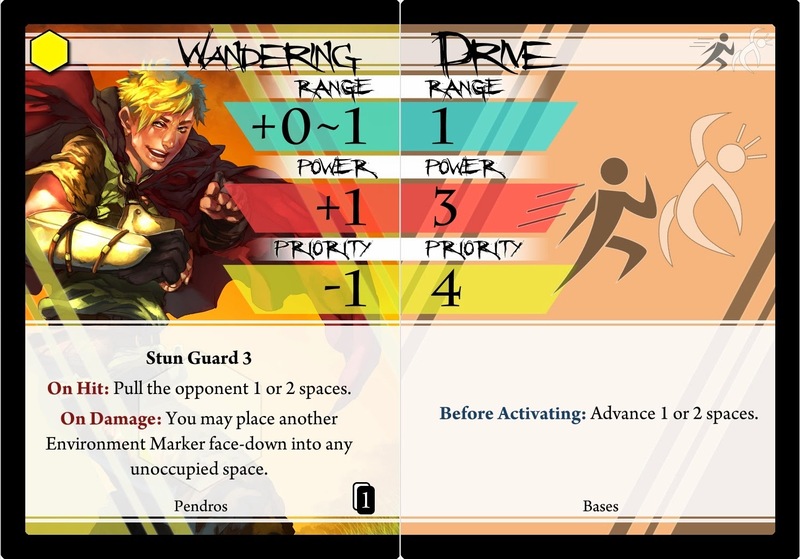 At the start of a Beat, both players choose an Attack Pair from the cards that their character has access to. The Style, or card on the left, modifies the Base, or the card on the right. The premise is simple, but you can make some crazy things happen. Next Players check who has a higher Priority. Whoever has the highest priority goes first, and does all of their effects, including damage and movement. 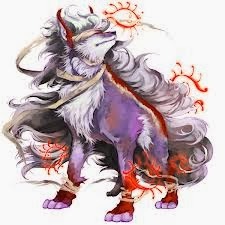 Then if the next player isn't Stunned (Either by taking more damage than they have Stun Guard, or by an effect of an attack pair) that player initiates his effect. Then the cards recycle, basically putting them on a two turn cooldown. And that's a full beat. The game continues until one fighter is left standing. Like I said, sounds simple. The brilliance of Devastation comes from the character design. The woman with the Demon Claw: every time she hits you, she gets tokens she can use to make herself more powerful. The Sniper can lock on to targets reducing their priority by a bunch. The Creation and Destruction guy, he gets different effects depending on what plane he's fighting from, but if all his planes collapse on him, he dies. My dog, she may gain range or power or defense depending on how much faster or slower she is than the opponent. and the list goes on and on. Each character is so uniquely different that duels between characters always feel new and exciting. And the best part? A regular duel takes about 20-30 minutes, so it's easy to bring to the table. But like Billy Mays, Devastation comes back with a "That's not all..!" There are variations in the back of the book that change the way the game is played. Want to be more powerful? Try and EX or Almighty duel. Have more than 2 people? Play a 2v2 team battle, or team up and fight one of the four included bosses that can either be run by the game, or by another person. Fighting games not your style? How about we turn the board into a floor in a dungeon, and suddenly this game is a co-op dungeon crawler. There's just so much content in this game that a full rundown of everything you can do would take an eternity, so I'll leave it at this: It looks great, plays great, and has more flavor than Emeril Lagasse's kitchen. A 70$ price tag is a bit steep, but trust me, you'll get way more mileage than that out of Devastation. Great, quick review! I loooooooove this game and the value you get, even for $70, is huge. The game feels like its worth over $100, easily. So many characters, all unique, so many modes of play, so much depth.